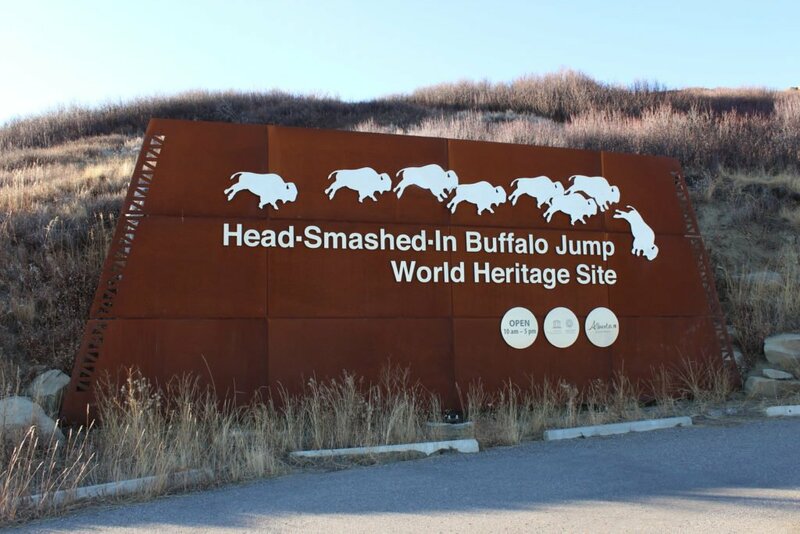 If you have driven through Fort Macleod in southwestern Alberta, Canada, you may have noticed a blue highway sign proclaiming “Head-Smashed-In Buffalo Jump Next Exit.” It is a location name that sort of sticks with you and makes you want to go find out more. And you SHOULD! The Head-Smashed-In Buffalo Jump is a UNESCO World Heritage Site and hosts a fantastic cultural experience of the lives of ancient Plains people. The location is significant for its cultural, archaeological, and scientific interest. It is one of the oldest and most well-preserved sites known that gives an archaeological insight into communal hunting and living by people over 6,000 years ago. 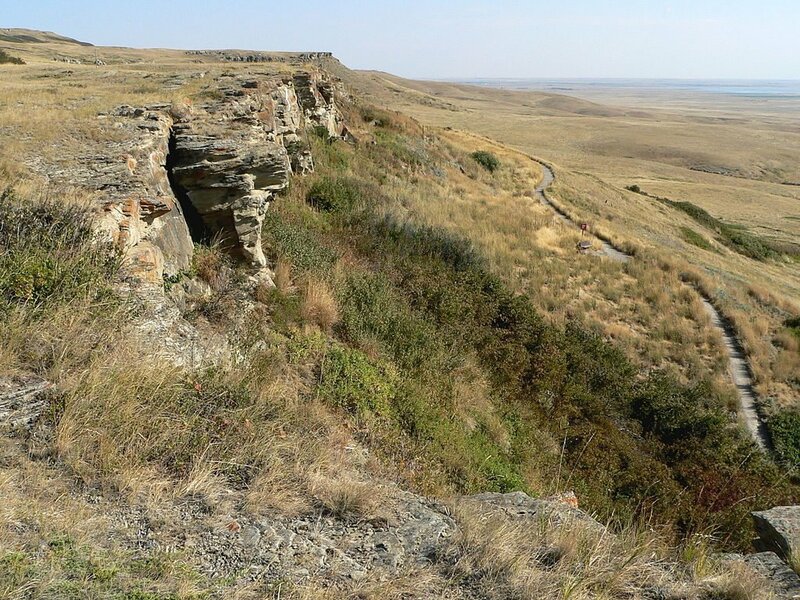 The buffalo jump was used by indigenous people of the plains, including the Blackfoot, to kill buffalo by driving them off the 1,000-foot long, 36-foot high sandstone cliff. A known buffalo grazing area was located west of the site. Specialized young hunters, called Buffalo Runners, would dress as coyotes or wolves and use their knowledge of animal behavior to drive the herd into drive lanes and then over the edge of the cliff. After falling, injured buffalo were killed by waiting hunters. The community camped below the cliffs would then work together to process the carcasses and use them for food, tools, hide, and to appease the spirits. This technique was used throughout many plains areas in North America. The interpretive center at the Head-Smashed-In Buffalo Jump includes indoor and outdoor exhibits and experiences. The site is open year-round with various events showcasing the complex prehistoric cultural aspects. Storytellers and artists are often available, as well as a permanent exhibition of photography called “Lost Identities: A Journey of Rediscovery” that began in 1999. You can take an interpretive hike with a knowledgeable Blackfoot guide to visit the drive trails where ancient Plains people would drive buffalo to the cliff face. In addition, you can see the work of archaeologists who are learning about the ancient cultures from the artifacts in the area, and you can learn about the importance of buffalo to the Plains people, and their eventual demise. There is also a re-enactment of the hunt to give visitors a better insight into the life and customs of the ancient Plains people. Check Campground Reviews for campgrounds near Fort Macleod for a place to stay! Thanks for bringing this to our attention. Next trip north, we will stop and explore.